The Republic of Ireland's cabinet has agreed to appeal against the European Commission's ruling that Ireland granted undue tax benefits of up to €13bn (£11bn) to Apple. Taoiseach Enda Kenny said he made no apology for defending the Irish government's right to appeal. The decision to appeal was agreed by the Irish cabinet on Friday morning. Apple chief executive Tim Cook said he was "very confident" the ruling would be overturned on appeal. He called the European Commission's decision "maddening" and "political". Speaking after the cabinet meeting, Mr Kenny said: "This is about Ireland, it is about our people, it's about us as a sovereign nation, actually setting out what we consider our appropriate policies". "A motion will come before the Dail (parliament) on Wednesday seeking an endorsement of that decision," said a government spokesman on Friday. 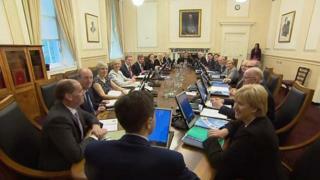 The cabinet first met on Wednesday but decided to adjourn until Friday for "further time to reflect on the issues and to clarify a number of legal and technical issues". This is a minority Fine Gael government that includes independents. It is dependent on the support of the main opposition party, Fianna Fáil. Fianna Fáil has indicated that it wants to see an appeal of the commission's ruling, if only to see who is right - Brussels, or Dublin - on whether or not the Irish government had a secret deal with Apple. Also at stake is the credibility of the independent tax authority in the Republic, the Revenue Commissioners. For the government to turn down 13bn euros, equivalent to the country's annual health budget, is a huge political ask. The government's view is that it is in Ireland's long-term interest not to be seen as a tax haven, but to be seen as transparent regarding its taxation. Apple chief executive Tim Cook said on Thursday that the European Commission's decision was "maddening" and "political". He was "very confident" the ruling would be overturned on appeal, he added. However, European Competition Commissioner Margrethe Vestager rejected Mr Cook's claims. "The is a decision based on the facts of the case, looking into Apple Sales International, how they are arranged within Ireland, and the profits recorded there," she said.